A doctor struck off the medical register for the evidence she gave in so-called "shaken baby" cases, has been reinstated. A High Court judge cleared Dr Waney Squier of dishonesty and said there were significant flaws in the medical tribunal's findings against her. But he added that her actions did amount to serious professional misconduct. She will not be allowed to give expert evidence in court for three years. The paediatric neuropathologist had acted as an expert witness in six cases, including the deaths of four babies and a 19-month-old child. She disputed the existence of shaken baby syndrome - brain trauma caused by violently shaking an infant - and in each case said the evidence was not consistent with non-accidental injury and was more likely to be caused by other means. 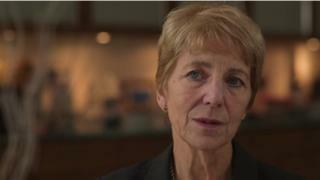 Dr Squier has argued that she has been scapegoated for challenging the mainstream view. In March, a Medical Practitioners Tribunal Service (MPTS) hearing concluded she had been dishonest, dogmatic, and misleading in her evidence in those cases. She has since been suspended from her post at Oxford's John Radcliffe Hospital. But in his ruling the judge, Mr Justice Mitting, found there were significant flaws in the tribunal's findings. He concluded that Dr Squier had gone beyond her expertise and also misrepresented some research, but said her views were honestly held. The doctor, who has always denied any wrongdoing, says she is pleased to be able to return to her clinical work. The General Medical Council, which brought the case against her, says the judgement confirms that this was not about the scientific debate around shaken baby cases, but about the manner in which Dr Squier had given her evidence. In a statement, it added that "the ruling makes clear that she acted irresponsibly in her role as an expert witness on several occasions".